Malaysia's Immigration Department said Saturday that former scandal-ridden Prime Minister Najib Razak and his wife are barred from leaving the country, shortly after he announced plans for a short holiday. A leaked flight manifesto shows Najib and his wife Rosmah Mansor were due to leave on a private jet on Saturday to Jakarta, fueling rumors he was fleeing the country to escape possible prosecution over a massive corruption scandal involving the 1MDB state fund. His coalition suffered a shocking electoral defeat this week that ended its 60 year-rule. Najib's statement on social media didn't say where he was heading to but he said he is committed to "facilitating a smooth transfer of power." He apologized for his mistakes and shortcomings and said he intends to continue serving the people. "I pray that after this divisive period, the country will unite," he said. The Immigration Department, which had initially said there was no travel blacklist for Najib, later issued a brief statement that Najib and Rosmah "have just been blacklisted from leaving the country." Najib responded swiftly by saying he respected the department's ruling and will stay with his family in the country. His holiday plans come as strong calls emerged from his ruling Malay party, which dominates the National Front coalition, for Najib to step down over the election results. The National Front, which has ruled Malaysia since independent from Britain, obtained only 79 of the 222 parliamentary seats, losing power to Mahathir Mohamad's four-party alliance amid public anger over the 1MDB scandal and rising cost of living. It was a remarkable comeback for Mahathir, who was premier for 22 years until his retirement in 2003. Mahathir, who is now the world's oldest elected leader at 92, has said his government will not go on a witch-hunt over the 1MDB fiasco but that Najib will have to face the court if he's found to be responsible. The fund was started by Najib when he took power in 2009, but it accumulated billions in debts and is being investigated in the U.S. and several other countries. U.S. investigators said Najib's associates stole and looted $4.5 billion from the fund, of which some $700 million landed in Najib's bank account and some $30 million used to buy jewelry for his wife. 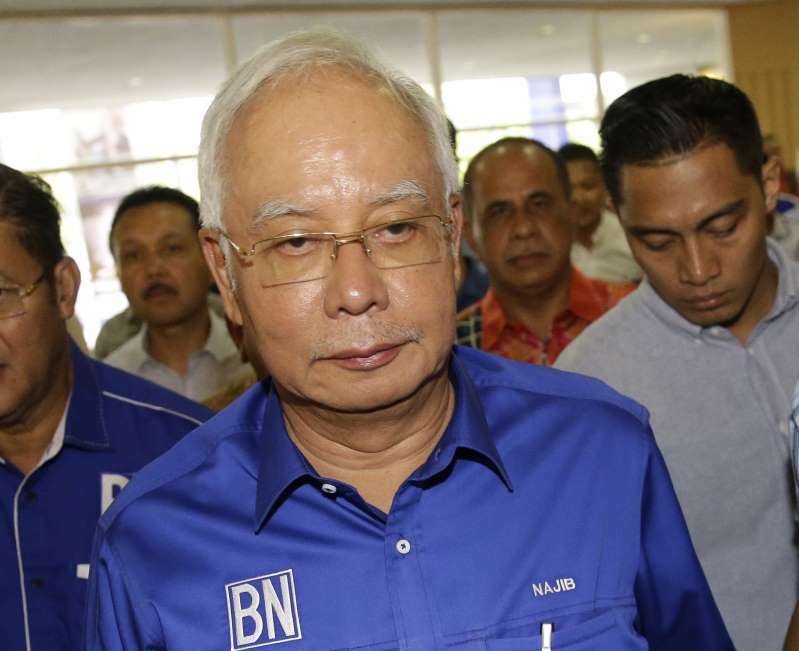 Najib denies any wrongdoing. He sacked critics in his government including an attorney general and a deputy prime minister and muzzled the media. The new Attorney-General Mohamed Apandi Ali cleared Najib in 2016, saying the money was a donation from the Saudi royal family and that most of it was returned. Mahathir, who is due to name his cabinet later Saturday, has indicated that Mohamed Apandi would be axed for hiding evidence of wrongdoing.